Small mower – big performance. That may be the best way to describe the Scag V-Ride. 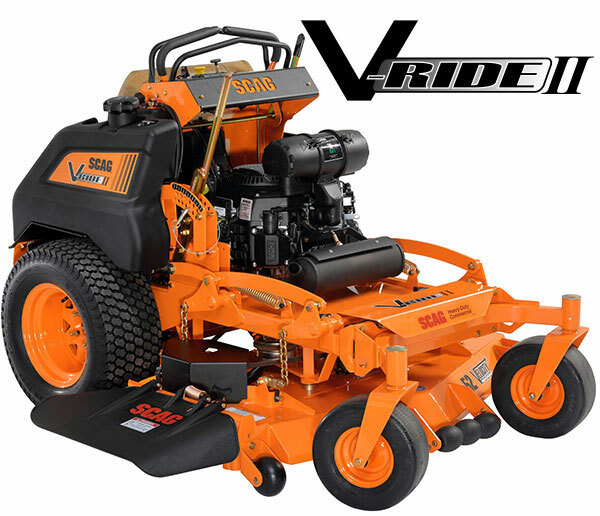 With a much shorter wheelbase, the V-Ride is able to go places and do things standard zero-turn riding mowers cannot. Smaller size. Landscapers never seem to have quite enough trailer space to fit everything on. With the operator platform lifted up, the V-Ride fits neatly on a trailer - its total length as short as 65.5 inches. This small mower can fit through gates and other narrow passages when equipped with a Velocity Plus deck as narrow as 36”. Its smaller size gives it superior maneuverability and makes it excellent for mowing small spaces. Big Performance. The V-Ride carries Scag’s reputation of stellar performance. From its heavy-duty steel frame to the powerful engine choices and Velocity Plus deck, the V-Ride is built to withstand years of hard use. Efficient engine models from Kawasaki and Kohler deliver smooth reliable performance. A strong Ogura PTO clutch engages and disengages the blades quickly and smoothly. Dual Hydro-Gear pumps deliver power to the large drive wheels for a productive ground speed of 7.7 mph to 11 mph depending on the mower size. The Velocity Plus deck features heavy-duty blade spindles, tapered roller bearings and Marbain blades creating a beautiful, manicured lawn. Operator Convenience. The operator’s spacious platform has coil suspension delivering a smooth ride and reducing operator fatigue. Comfortable, straightforward controls simplify operation even for new operators. The full-featured instrument panel is easy to reach with ignition key, choke, throttle, PTO switch, drive and neutral lever and digital hour meter. The padded operator cushion can be adjusted for ultimate comfort during operation. Keep your V-Ride mower in top operating condition with Factory Original parts from ScagOEMParts.com. Locate parts to repair, service or maintain your Scag with our online parts tool look up.